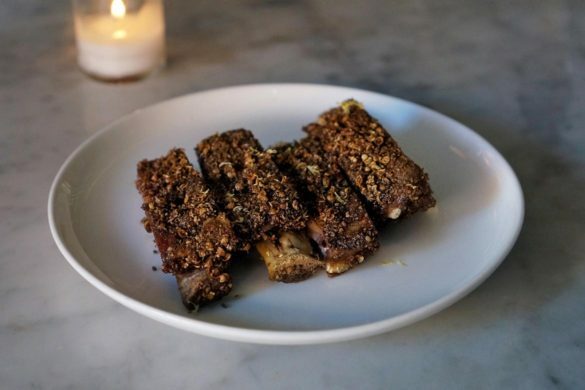 As I was planning my NYC trip for The World’s 50 Best Awards, I reached out to all of my local (and worldly) food expert friends for their essential reservation recommendations. One name came up time and time again: Estela. The coming together of Uruguayan Chef Ignacio Mattos (a chef boasting a very respectable CV including a stint at Alice Waters’ Chez Panisse) and restaurateur Thomas Carter, the former beverage director at Blue Hill by Stone Barns (no.48 on the World’s 50 Best List), Estela is a NYC neighbourhood joint that has grown into a giant killer. Rocketing into no.44 on the 2016 World’s 50 Best Restaurant list, Estela is certainly making it’s mark on the culinary landscape. No tasting menus here, it’s sharing style – a just-long-enough menu composed of simple sounding dishes that are deceptively complex. 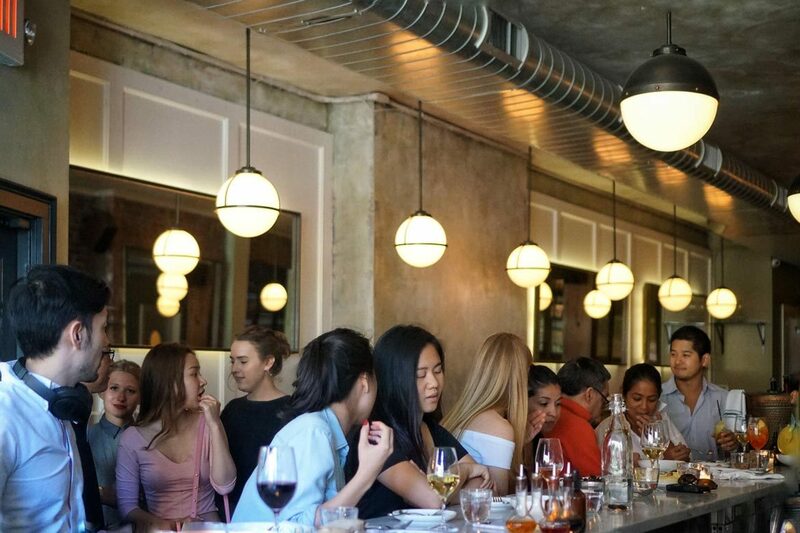 It’s ‘casual’ gastronomy elevated, in an effortlessly stylish way that only NYC can whip up, naturally. 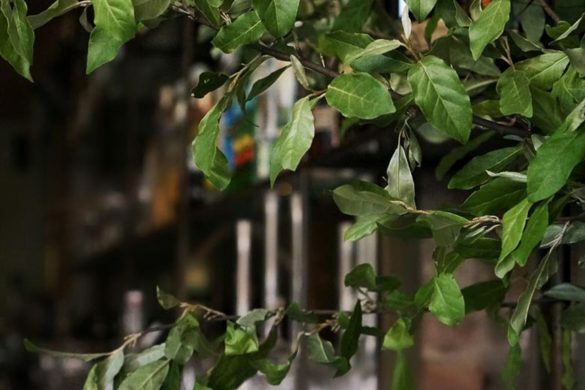 You’ll struggle to choose what to order from their exquisite menu – take some extra dining partners along so you can sample a wide range of their delicious creations. 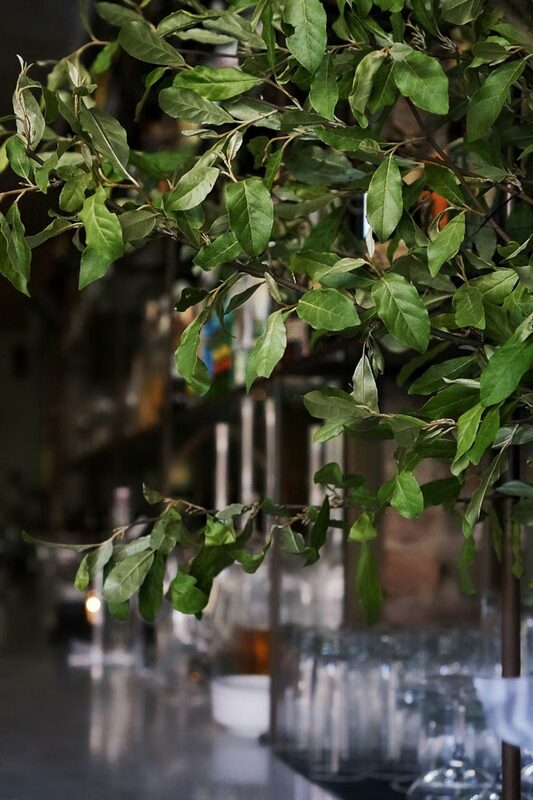 You’ll need to book if you want a table, but walk-ins can grab a spot at the beautiful wrap around marble bar. Tables of 6 or more will need to enquire about the daily set menu for groups. Things got off to a fantastic start with Estela’s Lamb ribs with charmoula and honey ($21) – ribs that are gaining notoriety around NYC. Amazing texture and layers of flavours abound, the meat having an almost cured appearance and covered in a thick coating of spices. I ate the entire four myself and honestly could have gone another round. 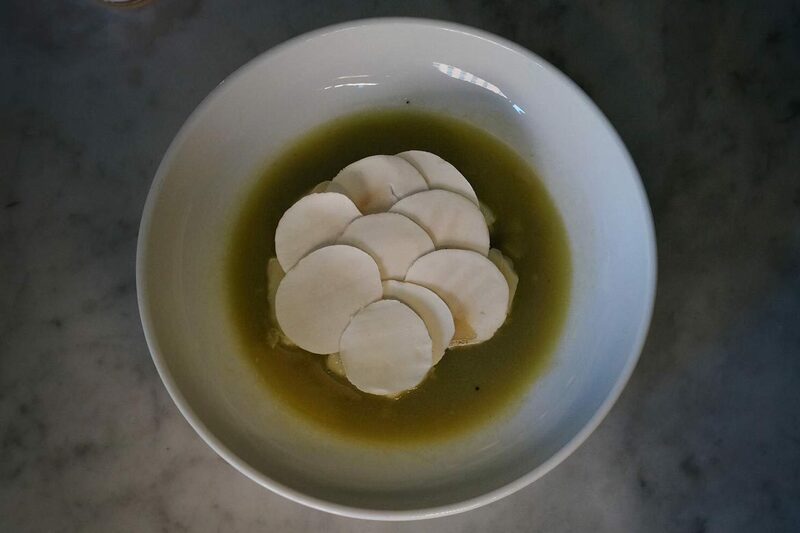 The Ricotta dumplings with mushrooms and pecorino surd ($25) are a must order. 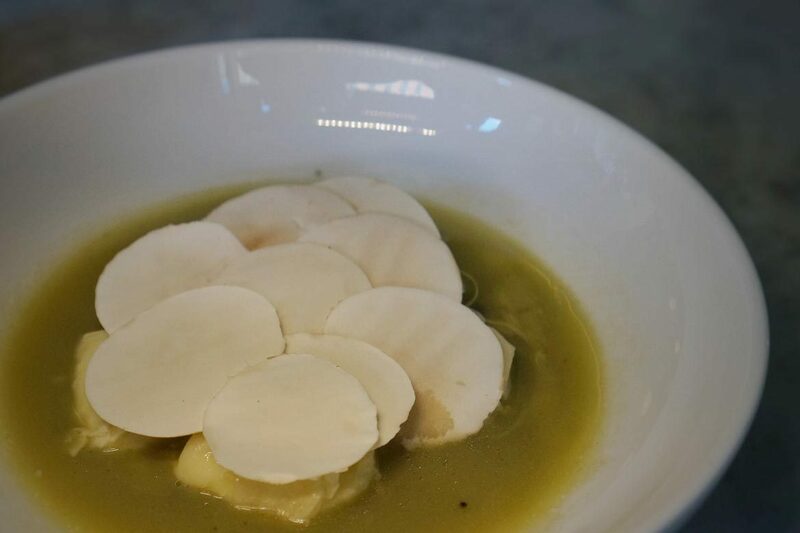 Surrounded by a delicious broth and pretty as a picture, these pillows of creamy goodness lay hiding under ‘scales’ (in case you’re wondering, it’s finely sliced button mushroom). This is one you’ll want to share though, the cheesy parcels are quite indulgent! 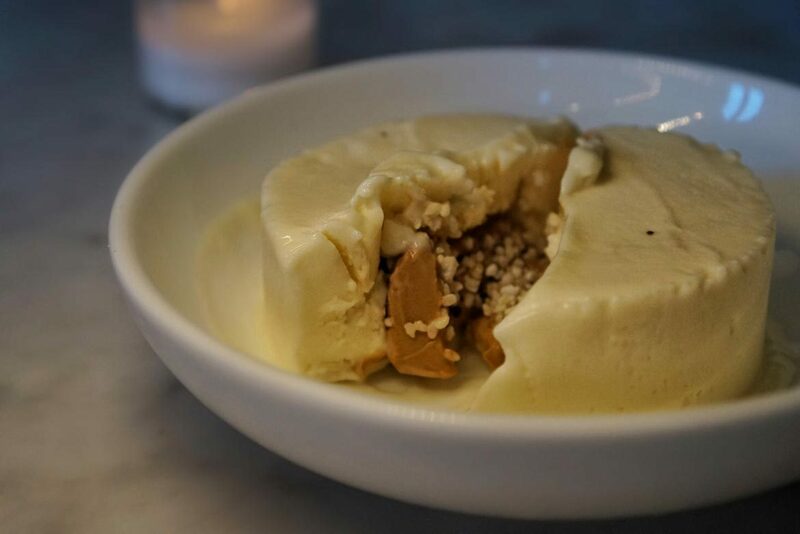 For desert I took a walk on the wild side and chose the intriguing Parsnip ice cream, sesame, caramel ($12). I’ve had plenty of ‘interesting’ ice cream flavours over the years that don’t usually live up to the description, so I wasn’t expecting this dish to scream ‘parsnip’. I shouldn’t have underestimated the Estela team – this ice cream definitely tasted like parsnip, in fact, a little too much so for me. The hidden pocket of caramel and sesame was the key to making this dish work as a dessert, but I felt the balance was a little out – there was far too much parsnip ice cream in relation to the caramel filling. This just tipped it over to the ‘challenging’ side for me, but I love the innovative thinking in this dish. 47 East Houston Street, at Mulberry Street, upstairs. 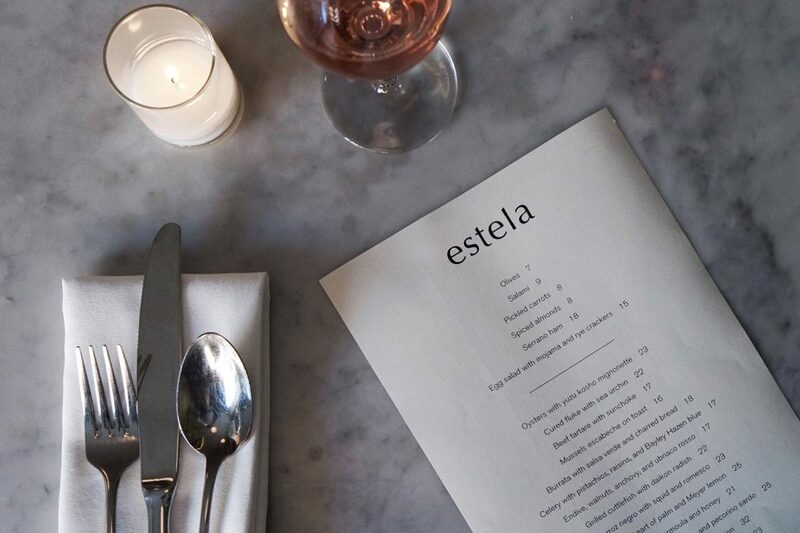 Estela takes reservations up to 30 days in advance online and over the phone, 212-219-7693. For parties of 6 or more, Estela offers a nightly prix-fixe menu served at either 6:30pm or 9:30pm.